CCM Premier 1.5 Junior Blocker | Sports Etc. Centered palm position helps with the overall balance of the blocking board. Suregrip and Nash suede hand grips helps to maintain a firm hold on the stick. Reinforced hand for added durability. Ventilated mesh maximizes air-flow to promote freshness. Injection molded thumb helps to better protect you from those pesky puck bounces and opponents’ stick blades. Heat laminated dual density foam with PE to help direct rebounds. Adjustable fit allows you to easily stick handle any puck. When first introduced, the Premier blocker helped to change the game by extending the inside edge shot blocking surface down over the cuff, thumb and first finger area. 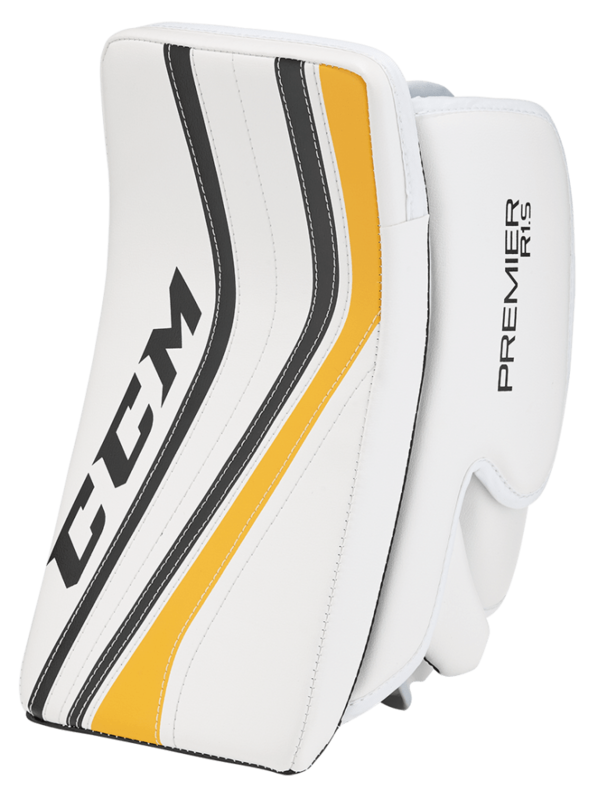 With more rushes to the net and harder shots the CCM Premier blocker is designed to protect goalies’ for today’s evolving game. And just as important as protecting what’s behind the blocker is directing the puck out of play, the dual density foam board blocking surface helps in getting the puck cleared where you want it. Sports Etc Performance To Value Rating– 8 out of 10- Extremely lightweight blocker made with a durable dual-density foam. Great for any junior-sized goaltender.